How to learn blocking in volleyball? 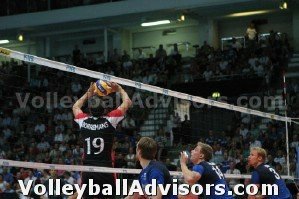 How to determine where the setter sets the ball? How to determine what direction the spiker attacks? How to read the spiker? After knowing where the setter sends the ball, the blocker moves the eyes at the hitter. If the set travels far out, player tends to hit sharp angle. Also when the set is off the net, spikers tend to hit angle. If the ball is in the perfect hitting position next to antenna, the play tends to swing the line shot. If the set is really tight, it is even more likely that spiker tries to swing the ball line. If your block is running late, watch out - smart hitters will try to "tool you", using your block to score a point. If the player approaches straight, they tend to hit the ball line. If the player starts the approach off the court and approaches from the angle, more likely the player will hit the ball to angle. Generally speaking more balls are hit to the angle, since it is an easier spike for the hitters. If the hitter is off-balanced and not in good position to hit the ball, the hitter may try to "tool the block", "use the block". Be also ready for the off-speed shots. The hitter may also choose to hit an off-speed shot to the block just to cover the ball up. If you form a well-balanced double or triple block in front of the hitter, a talented hitter may try to tool you and hitting off the tips of your fingers. If the set is low and inside, most likely the spiker hits the ball angle. 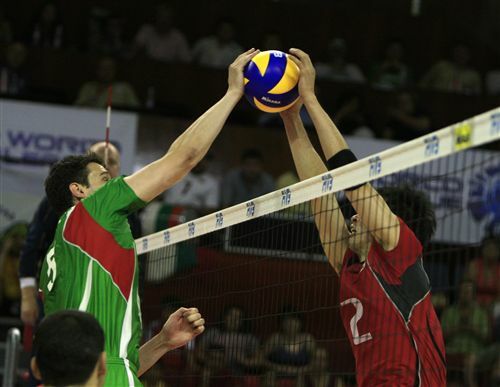 It is extremely important for blockers to communicate with each other when the opponent is attacking. For example, if one blocker observes the player is running inside s/he should talk it to the teammates. Or if blockers observe pass being off, they need to communicate and start moving the triple block to block the higher and slower tempo set. In addition to being vocal, this communication could be silent, maybe a tap on the shoulder. If one blocker is clearly better reader than the others, s/he could place the hand on the teammate's shoulder or arm - and give the teammate a little push or pull to the desired direction. 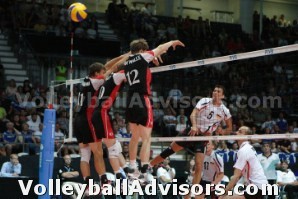 One of the best new volleyball rules has been the adjustment of the joust rule. Today referees do not call it off, if the ball stops between two players above the net. The key to win a joust between two players is to push the ball as long as you can, preferably with two hands. If you try to "attack" the ball with a short push, you'll lose the ball, if another player understands to "push and hold" the ball longer. The power helps to win jousts, but the most important thing is to push longer. Often shorter players win jousts against taller players because it is easier to push the ball up or sideways vs. down. When doing the joust being taller doesn't necessarily help you. Ofcourse it is still an advantage, if you understand that being higher is not the trick to win the joust - you just need to "push longer". As mentioned before the core body strength is important in volleyball, as in any other sport. When you are able to keep your middle body strong and steady, it also helps you to win jousts. The core strength also helps you to control your body in the air when blocking - and penetrate to the other side of the net to set up a steady block.